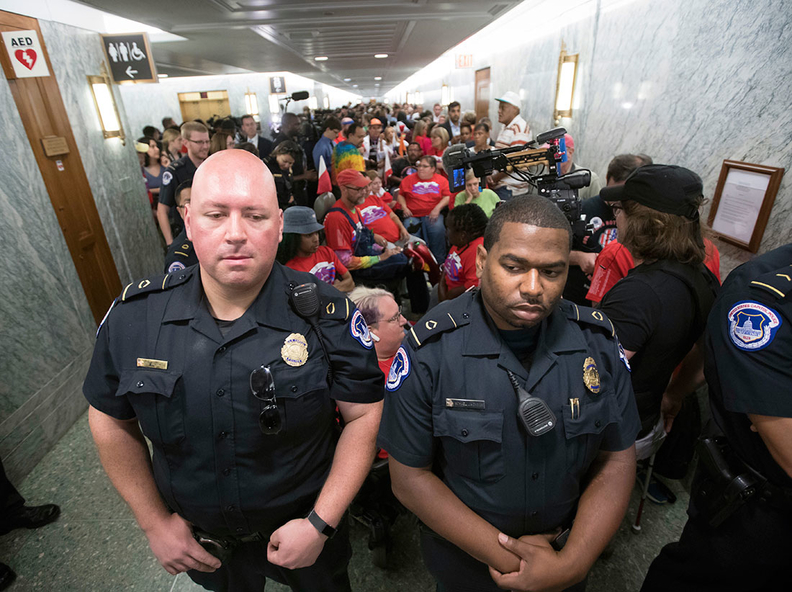 U.S. Capitol Police maintain order as hundreds of people, many with disabilities, arrive for a Senate Finance Committee hearing on the last-ditch GOP push to overhaul the nation's health care system, on Capitol Hill in Washington, Monday, Sept. 25, 2017. One of the Republican co-authors of the new Senate bill to repeal and replace the Affordable Care Act said at a hearing Monday that the biggest beneficiaries of his bill are the states that chose not to expand Medicaid. "I think if you're in a state that did not expand Medicaid, you are pleased about this bill," Sen. Bill Cassidy of Louisiana said at the Senate Finance Committee hearing to consider the Graham-Cassidy bill. The bill would convert the ACA's funding for premium and cost-sharing subsidies and Medicaid expansion into $1.2 trillion in state block grants through 2026 and let states design their own systems, with few limitations on how they could use the money. There is no provision for funding the block grants after 2026. States that expanded Medicaid and enrolled lots of people in ACA marketplace plans would suffer the biggest financial losses. Many of those states, such as Ohio and West Virginia, are represented by GOP senators whose votes are needed to pass the bill. Over the weekend, Republicans added $14.5 billion to the measure including extra funds for states of wavering GOP senators. But hospital leaders in those states remained fearful that the bill would lead to a loss of coverage in their states and a rise in uncompensated-care costs. A chart that Senate Republicans circulated said the bill's revised version, released Monday morning, would provide 14% more federal funding for Arizona than under current law, Kentucky would get a 4% increase, Texas 49%, Alaska 3% and Maine 43%. Alaska and Maine are represented by Sens. Lisa Murkowski and Susan Collins, respectively, two Republicans who helped kill the previous Senate repeal bill and whose votes are pivotal to passing this one. The amended bill adds hundreds of millions of dollars in funding for sparsely populated states such as Alaska. "It is highly unlikely that they could make enough funding or policy changes to end our concern," said Shayna Diamond, a spokeswoman for the Arizona Hospital and Healthcare Association. Hospitals in Alaska also remained unmoved by the eleventh-hour changes to bill. Even with the additional money, on a net basis the state still would be a loser, said Becky Hultberg, CEO of the Alaska State Hospital and Nursing Home Association. "It would still result in an increase in the uninsured population, and the bill's block grants would be technically challenging to implement," she said. "Both of those remain major concerns for the association." Hospitals in Maine were concerned that there were still too few details about the bill to determine the impact, said Becky Schnur, a spokeswoman for the Maine Hospital Association. Physicians, hospitals, insurers and patient groups also continued to slam the bill Monday. The American Academy of Family Physicians said the revised version of the bill released over the weekend fails to ensure coverage for essential benefits. It issued a joint statement with America's Health Insurance Plans, the Blue Cross and Blue Shield Association, the American Hospital Association and the American Medical Association opposing the bill. The AAFP said the Graham-Cassidy bill allows insurers to charge older Americans premiums that are five times greater than those for younger people. The bill would destabilize the individual insurance market and end the Medicaid expansion for low-income adults, the AAFP said. "The result will be millions of Americans who have no access to needed medical care because they cannot afford or are denied health insurance," AAFP President Dr. Michael Munger said in a written statement.